Prashanth Ravi, successfully defended his Doctoral Research. The title for his doctoral research is Towards the Fabrication of Bioresorbable Constructs with Customized Properties using Additive Manufacturing. Congratulations are in order for Dr. Ravi! Prashanth's research was a collaborative effort between UTA and UTSW Medical Center in Dallas. He was advised by Dr. Shiakolas and Dr. Welch (UTSW). Congratulations to Prashanth for a great job on his research on Additive Manufacturing for bio-related applications with a employing a custom developed setup and characterizing the process for a newly developed bio-polymer towards the fabrication of biomedical scaffolds! Looking forward to your contributions to the research community! Your considerate and pleasant persona is well respected and recognized. Keep up the good deeds and continue being an inspiration to the MARS Lab group! Congratulations and we look forward to your continued successes! Photos after the successful defense! Phillip James, aka Zach, successfully defended his MS thesis research. Zach's research was a collaborative effort and he was advised by Dr. Shiakolas and Dr. Aswath of the MAE and MSE departments of UT Arlington respectively, and Dr. Varanasi of Texas A&M School of Dentistry (Dallas, TX). Congratulations to Zach for a great job on the analysis of ceramic materials for the fabrication of biomedical scaffolds! Samson Adejokun successfully defended his MS thesis research. Congratulations to Samson for a great job on the design and kinematic analysis of a micro-robotic device! 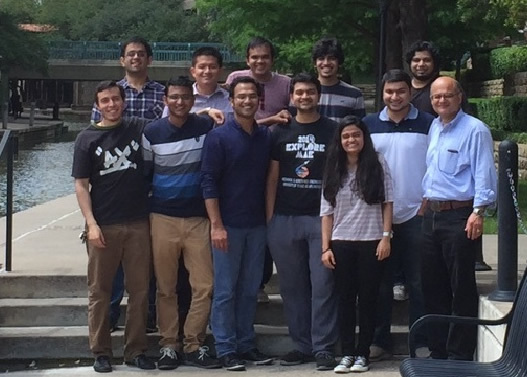 The lab would like to welcome four new members, Kashish, Ravi, Sudip, and Parimal. Kashish, Ravi and Sudip will work in the area of Robotics - Human Robot Interaction and Parimal in the area of Additive Manufacturing. We look forward to their contributions and welcome to the MARS Lab family! Congratulations to Christopher Abrego for passing his doctoral comprehensive exam! Chirstopher passed his doctoral comprehensive exam, the second major hurdle towards completing his PhD on April 27, 2017!. Chris proposal is titled "On the Application of Machine Learning on Grasping and Haptic Feedback'. Congratulations to Prashanth for the Graduate Student Employee of the Year award! The MARS lab group is excited for Hasan - congratulations are in order! Hasan was offered and accepted a full time employment as a Product Development Engineer at Dentsply Sirona USA (https://www.dentsplysirona.com/en-us). He started work on April 3, 2017. We would like to wish Hasan and his wife all the best on their new adventure! The lab will miss the 'smiling guy'! Stay in toutch and hopefully we will see them soon! Long wait (2011 - 2016) but worth the wait! Congratulations to whole team for research well ops exceptionally completed! Congratulations to Hasan for having his journal paper accepted. Md Abu Hasan successfully defended his doctoral research. Congratulations to Hasan - now Md and PhD next to each other! 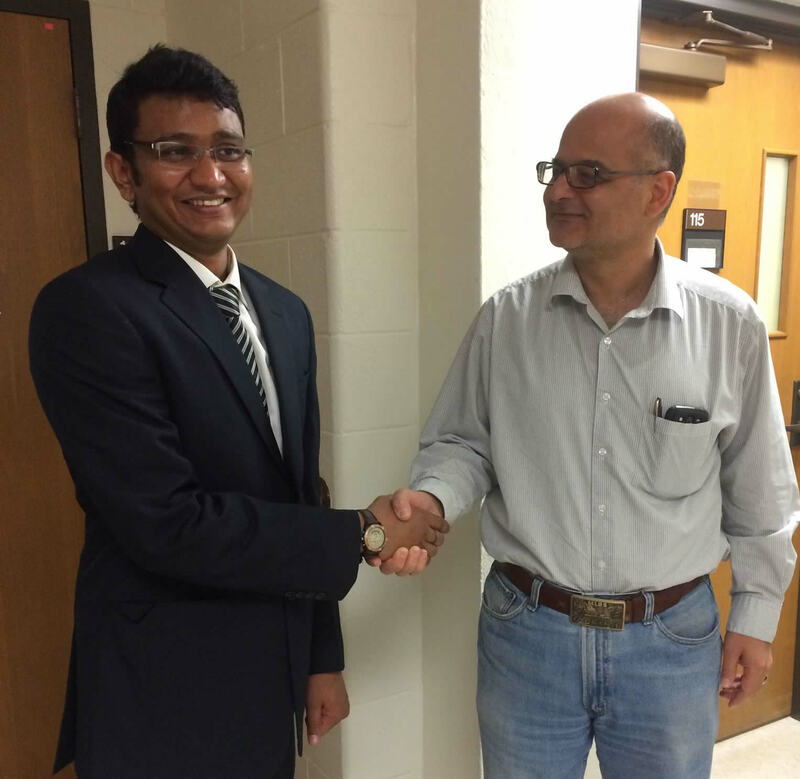 Shashank Kumat successfully defended his MS thesis research. Congratulations to Shashank and we look forward to your conitnued successes! 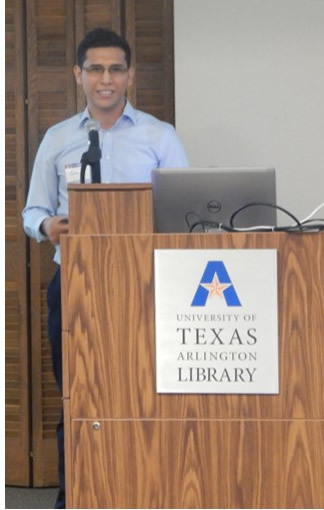 Saul presented on his McNair Scholars summer research project at the Friends of UTA Library award dinner on Nov. 3, 2016. Saul was selected as one of two finalists and was awarded a certificate and a monetary award! Saul and Chris during the award dinner . 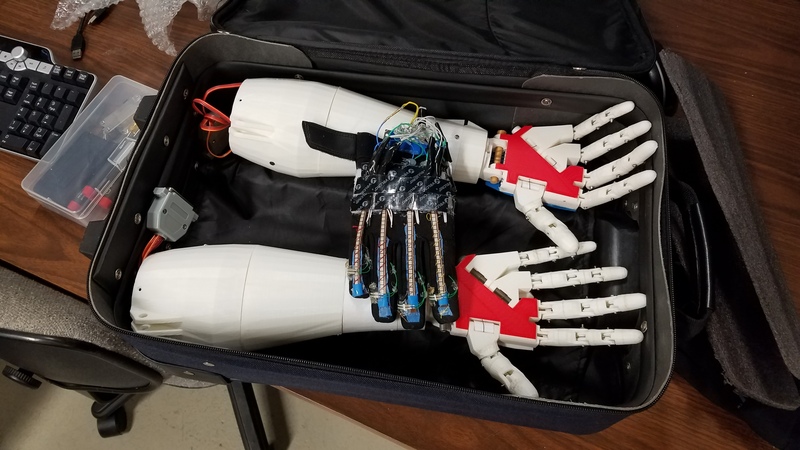 The MARS lab sponsored two senior design groups to continue research with the artificial hand. The two senior groups are from the MAE and CSE departments. We are looking forward to your accomplishments and contributions to the MARS lab activities! Michael succesfully defended his master's thesis. Unfortunately more details can not be disclosed due to intellectual propetty. Your desk in the MARS lab will feel lonely, hopefully for a short time! The senior deisgn team, Eddie, Samantha, Britton and Aaron, sponsored by the MARS Lab successully presented their project on the redesign of an artificial thumb with improved mobility. Congratulations and we look forward to your continued successes and participation in the research activities of the lab! 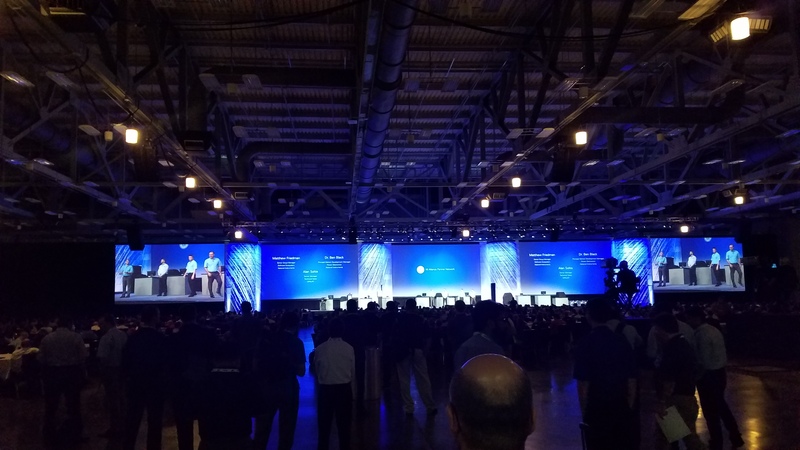 The MARS lab participated in the NI Week 2016 in Austin, Texas. 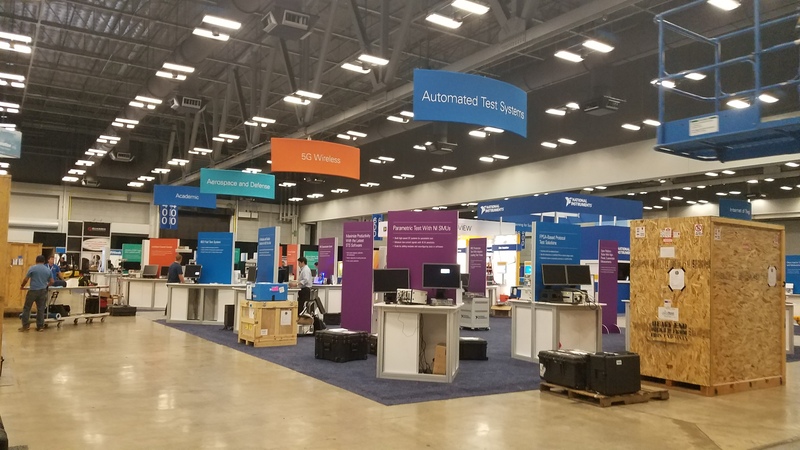 The NI Week was held for 4 days at the Austin Convention Center. 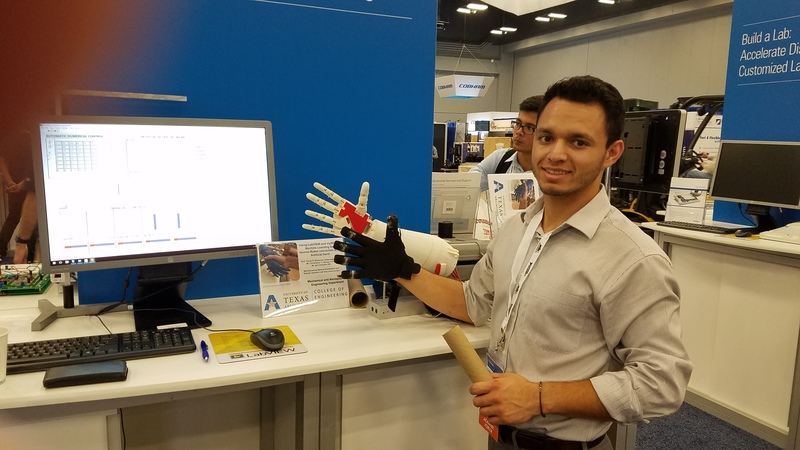 The lab had a poster at the academic forum titled "Using LabVIEW and myRIO in Machine Learning for Human Robot Interaction with an Artificial Hand". 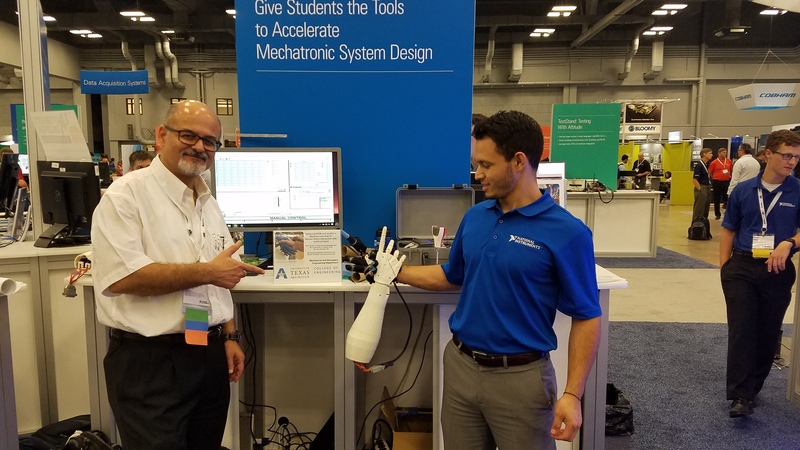 In addition, the lab was provided a booth where they demonstrated the current state of their research work in HRI and Machine learning with the artificial hand. The demonstrations attracted a lot of visitors, from young to experienced, who were impressed especially when they used a sensorized wearable glove to control the hand motion to perform various gestures and especially handshakes. 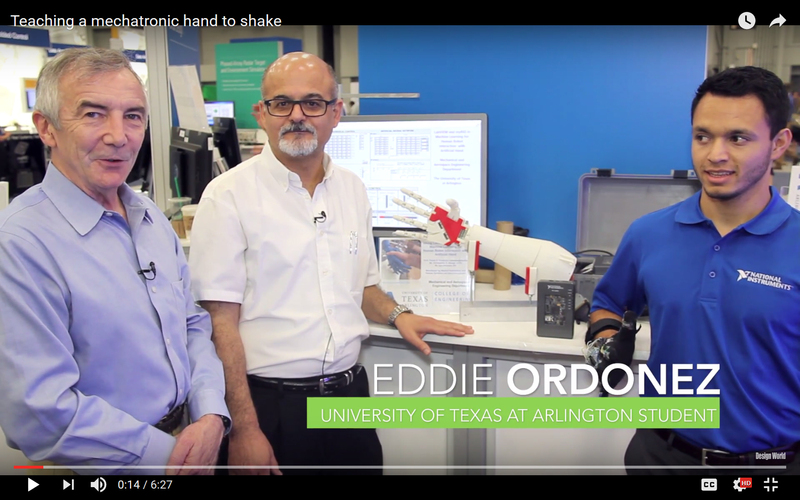 Link to a video by Design World on the UTA artificial hand "Teaching an artificial hand to (hand)shake". Mr. Lee Teschler (Design World) interviewed Dr. Shiakolas and Mr. Eddie Ordonez. Link to a youtube video during the Academic Forum showing the artificial hand and UTA team. The lab was represented by Heriberto (Eddie) Ordonez aka the plastic surgeon, Christopher Abrego and Dr. Shiakolas. 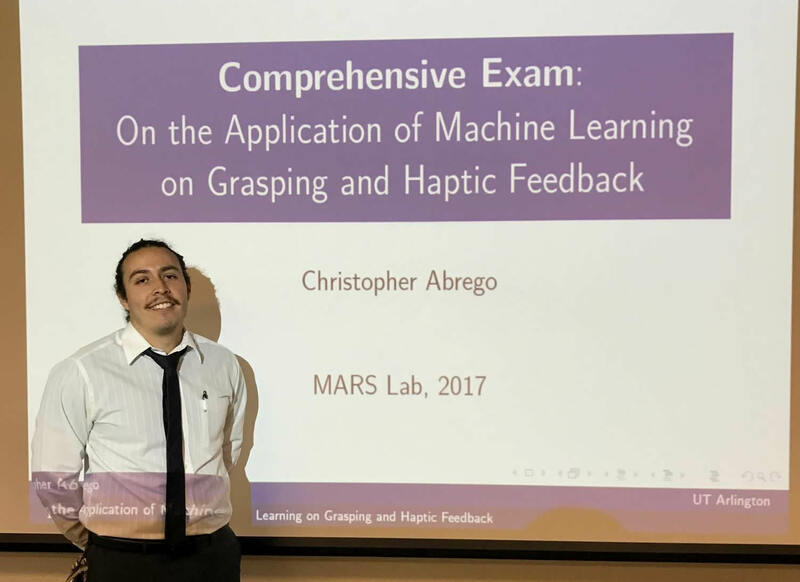 Saul completed his McNair's scholar innternship in the MARS lab where he iinvestigated and compared the machine learning algorithms in LabVIEW 2015 for their classification capability to identify the geometry of objects (cylinder or sphere). He presented his findings at the McNair's scholars forum. Saul worked closely with Chris and Dr. Shiakolas. The picture is from the McNair scholars dinner where certificates were awarded to all scholars. Congratulations are in order for three of the MARS Lab alumni for job offers and employment. The experience they acquired and software and hardware tools they learned during their research in the MARS Lab landed them job offers! Stay in touch and remember the MARS lab when you become wealthy and you are always welcomed to come back! 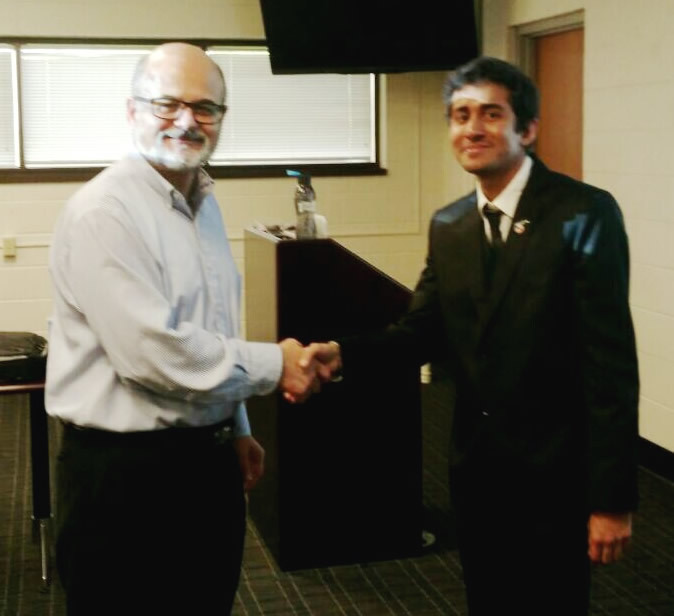 Utsav succesfully defended his master's thesis on Human Robot Interaction through Knowledge and Machine Learning approaches. He has developed an flexible, modular, expandable environment based on LabVIEW and myRIO for his work. This environment will be employed for continued research in HRI modalities. Matt succesfully defended his master's thesis on robotic based additive manufacturing. Matt has already received a job offer and he will start after completing the spring semester course requirements. He fell in love with robots - what can I say, I take the blame! Congratulations and we look forward to your continue successes! The lab would like to welcome Saul Gutierrez who joined in Spring 2016 as an UG assistant under the McNair Scholars program. Saul will be working with Chris and Utsav on mechatronics and more specifically on software development related to Human Robot Interaction employing an artificial hand. We look forward to his accomplishments. The lab would like to welcome Phillip Zachary James, who joined in Spring 2016 as a Graduate Research Assistant. Zach is a material science student who will be researching additive manufactring (3D printing) of βTCP for biomedical scaffold fabrication. We look forward to his accomplishments. The lab would like to welcome Compton Cooper who joined in Spring 2016 as an UG assistant. 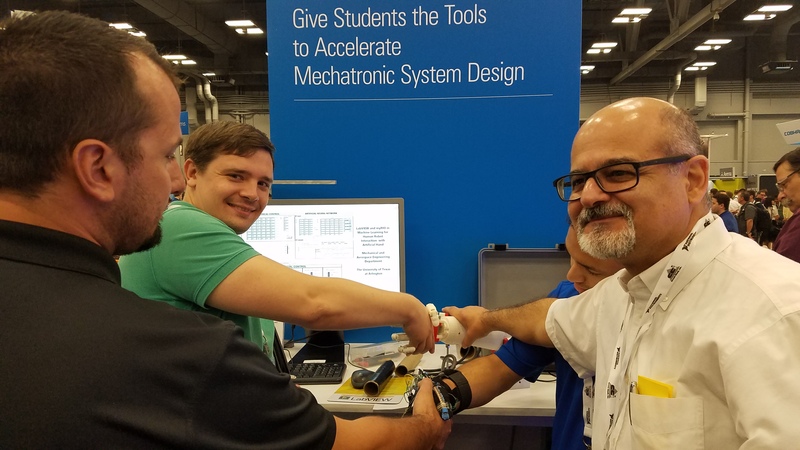 Compton will be working with Chris and Utsav on mechatronics related activities on an artificial hand. We look forward to his accomplishments. S. N. Khan and P. S. Shiakolas, Finite Element Analysis of Descemet's Stripping Automated Endothelial Keratoplasty (DSAEK) Surgery Allograft to Predict Endothelial Cell Loss, Current Eye Research, Accepted February 2016, DOI: http://dx.doi.org/10.3109/02713683.2016.1151052. S. N. Khan and P. S. Shiakolas, To Study the Effects of Intrastromal Corneal Ring Geometry and Surgical Conditions on the Postsurgical Outcomes through Finite Element Analysis, Journal of Mechanics in Medicine and Biology, April 5, 2016, DOI: http://dx.doi.org/10.1142/S0219519416501013. Tushar succesfully defended his master's thesis on additive manufacturing methodologies for multiprocess material scenarios. 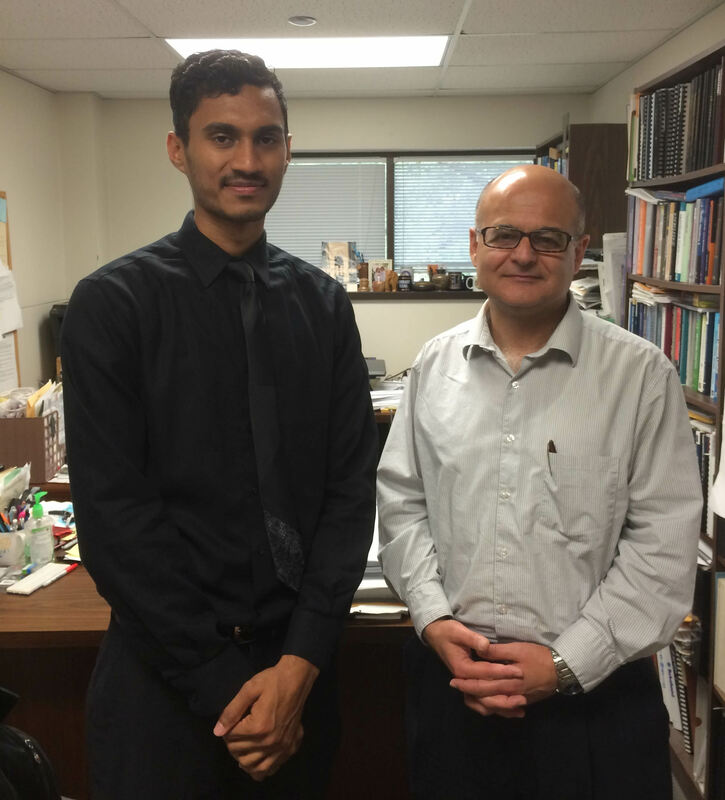 Tushar decided to continue his studies towards a doctoral degree at UTA on the same subject. Congratulations and we look forward to your continue success and contributions to the field of additive manufacturing aka 3D Printing! Shahid succesfully defended his master's thesis work on the development and characterization of the photopolymerization module of the multi-module 3D BioPrinter. Congratulations and wishes for continued success! Nov 2015 - The MARS lab was well represented at the ASME IMECE 2015 conference in Houston, Texas with 7 conference papers! The presenters included Dr. Shiakolas, Christopher Abrego, Prashanth Ravi and Hasah Abu. Congratulations to all and wishes for continued success! Nov 2015 - we would like to congratulate Prashanth for being awarded the prestigious Kelcy Warrent Graduate Fellowship by the college of engineering in November 2015. Wishes for continued success! Utsav, Samson, Divya, Mayankkumar, and Apoorv. We are looking forward to their accomplishments. August 2015 - we would like to congratulate the two iEngage UG scholars Kersasp Caswani and Fayruz Quazi for successfully completing the iEngage program requirements. Kersasp research the characterization of a 3D printing process under the mentoring and direction of Prashanth and Fayruz research dental nmodeling procedures to assist with FE analysis under the mentorning and direction of Hasan. August 2015 - we would like to wish Salman, ops Dr. Khan, and his wife Mahek all the best as they embark on their new adventure! Salman was an adjunct professor in the department during the summer and he has accepted a Computer Aided Engineer position with Faraday & Future, an electric car company, in Los Angeles, CA. The lab will be expecting one of these new cars in the near future! Congratulations and wishes for continued success to all the graduates and especially those associated with the MARS Lab! Dr. Shiakolas and Dr. Khan. The lab is looking forward to your accomplishments! 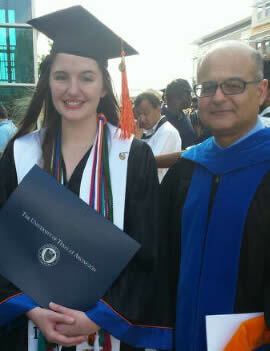 Erin after receiving her degree! The desk in the MARS lab is lonely! Some of the Pi Tau Sigma members at the graduation ceremonies. Kshitija succesfully defended her master's project on the characterization of the inkjet module of the multi-module 3D BioPrinter. Congratulations and wishes for continued success! The lab had an outing at a restaurant in Las Colinas to celebrate the the successes of the semester in a laid back environment. Congratulations to all for a job well done this semester and wishes for continued success! Sarode succesfully defended his master's project on the retrofitting with new electronics hardware and porting of a 4-axis CMM based microscope to LabVIEW. Congratulations and wishes for continued success! The senior project students working on the development of low-cost prosthesis successfully presented their project. Lead, Erin Smith, and the rest of the team were excited with their project outcome! 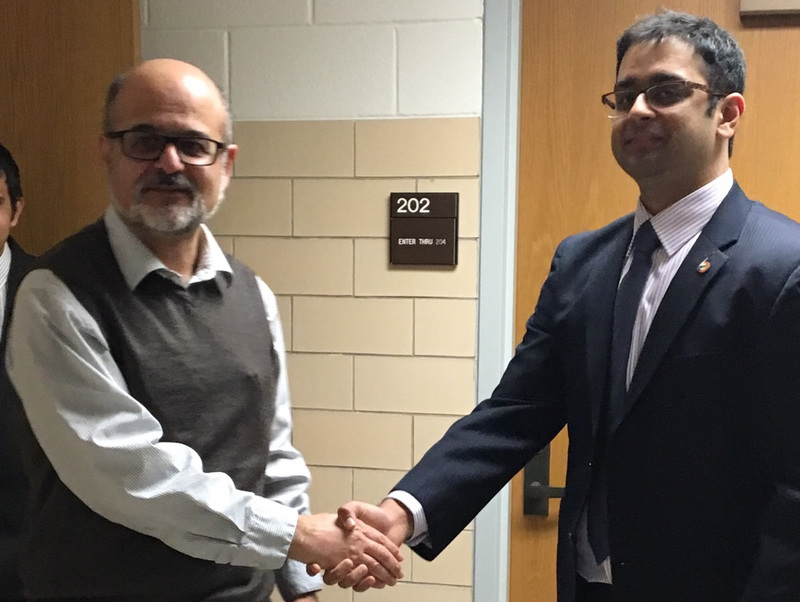 Salman succesfully defended his doctoral research work titled Biomechanical Analysis of the Cornea to Improve Post Surgical Outcomes Through Finite Element Analysis on April 15, 2015. Thank you to all the committee members. The lab is proud of your accomplishments and wishes you all the best on the next chapter of your professional and personal life. Congratulations and wishes for continued success! Thank you to all for a job well done representing the lab! Chris gave a presentation on his research titled "Survey on Haptics Devices and Sensors for Human Robot Interaction Research" at the AE/ME graduate student seminar class. His manuscript titled Descemet's Stripping Automated Endothelial Keratoplasty (DSAEK) Tissue Insertion Devices: A Review co-authored with Dr. Shiakolas and Dr. Mootha from UT SouthWestern Medical Center has been accepted for publication in the Journal of Ophthalmic and Vision Research. Congratulations and wishes for continued success! Happy New Year to all and especially the members of the MARS lab. I look forward to your continued successes and contributions to the mission of the lab in both the educational and research fronts. We would like to welcome a number of new members to the lab who will work on new research topics or participate in existing research.Congratulations for joining the lab and wishes for continued success! BioMEMS: Visitors interested in the research work on Micromanufacturing, BioMEMS and more specifically on Femtosecond Laser MicroManufacturing and Hot Embossing Microreplication Microfabrication are encouraged to visit the MicroManufacturing and BioMEMS lab website where details of the research and manufacturing facilities are provided. Long wait (2011 - 2016) but worth it! Congratulations to whole team! Congratulations to Hasan - now Md and PhD next to each other! Looking forward to your contributions to the research community! 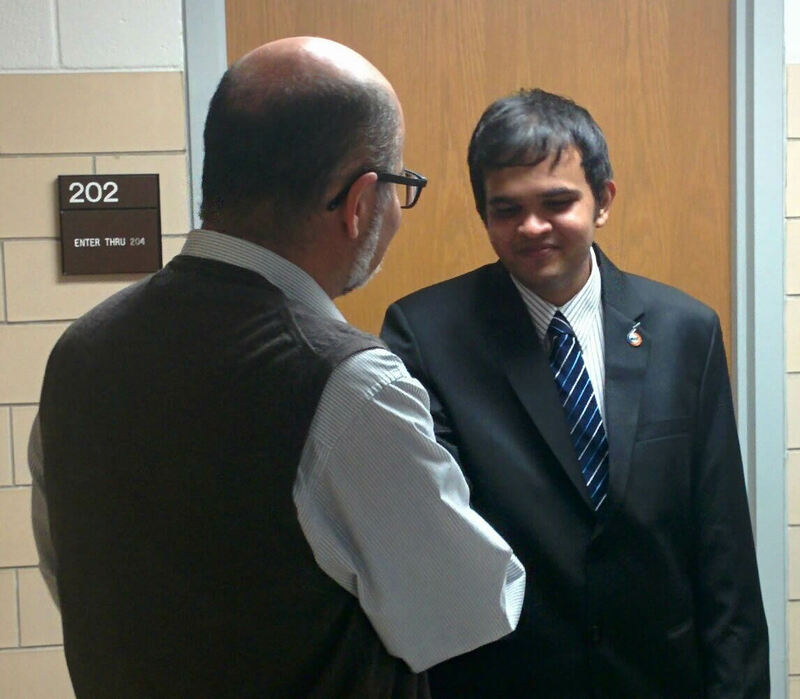 Shashank Kumat successfully defended his MS thesis research. Congratulations to Shashank and we look forward to your conitnued successes!